*This is not an affiliate post. I have not signed yet for this, still debating. Cet article ne contient aucun lien affilié. Je n’ai pas encore signé pour cela, j’y réfléchis. J’adore les couleurs et les modèles. C’est tout simplement magnifique 🙂 De quoi accueillir joyeusement ce petit bébé ! 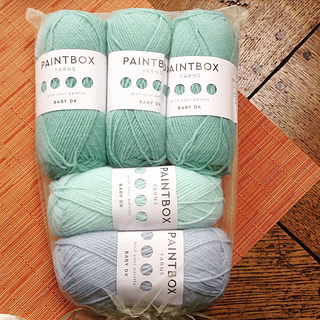 Wow, that is exciting to hear that you got such a yarn bonanza from loveknitting! I am part of the flock too and have never heard a peep from them! The green you chose is gorgeous, and I am totally in love with the green giraffe, hat and sweater set you created. So delicate and beautiful! Plus I learned an extremely important cultural lesson. I would never have guessed that it would upset someone to give them a baby gift so this was fascinating reading! Thank you Leah. I want to give a bit more cultural info in my blog posts, there are so many differences in our cultures and we can learn so much from one another. I’m glad you found it interesting. About the Flock, they might select based on location- shipping to France from the UK is no doubt cheaper than shipping to the US. Or it was done randomely and I hope you get some opportunities to test their yarn at some point. Take care. Tes créations sont pleines de douceur, j’adore!! Bonne et heureuse année et au plaisir de parcourir tes nouvelles réalisations en 2018. Félicitations c’est un très beau trousseau que tu as composé pour ce petit garçon. C’est vrai que chaque pays a sa culture et sa façon de faire, mais la tendance baby showers arrive en France … la fille d’une amie en a organisé sur le dernier trimestre de sa grossesse. Bonne et heureuse année pour toi et ta famille, au plaisir de découvrir tes nouveaux projets et tes réalisations. Merci Thali! Intéressant de voir que les showers arrivent ici, comme beaucoup de tendances d’Amérique du Nord d’ailleurs qui finissent par être adoptées chez nous. Moi aussi, j’ai hâte de découvrir tous tes beaux projets de l’année à venir. Bises et happy knitting ! What a wonderful gift this is! It would never have occurred to me to use these colors together, but I love the outcome–visually interesting while still calming and a bit understated. The giraffe is absolutely precious! Incredible knits! I love the subtle colours, here. And thank you for the resources. Having *3* friends who are expecting next year, I am on the lookout for good baby knits (and learned my lesson to go with acrylic this time, as well. Last year, I knit a wool blanket for a friend and understand now that handwashable-only items are time-consuming for new moms). Bisous de Toronto, and Happy New Year! Thank you Shirley! You can also go with a wool/acrylic blend like Cascade 220, that washes very well. It might felt a bit after a while but it does not matter that much as babies outgrow clothes so quickly. It seems you’re going to be busy with baby projects next year, happy knitting! Vous êtes en France encore ? Où, précisément ? Il me ferait _grand_ plaisir d’être là moi-même une fois de plus. Je suis en Bretagne, lovely region. Thanks for the kind words about my low contrast colorwork, I’ll have to check your reference. Yes, I will try to post more, life always seem to get in the way of blogging though. Take care! The Germans feel the same about gifts, or even baby equipment, before the baby is born. I remember my husband buying a baby bed the day after our son`s arrival. That’s interesting. So it is just not the French pessimism at work here, good to know. Being superstitious about birth is not confined to the French. There are some religions in which toys and clothing are not provided for the baby before birth, for exactly the same reason. Now that we Americans make such elaborate baby showers and rooms for the baby, with matching curtains and wallpaper and framed artwork I always picture some poor woman whose baby was stillborn sobbing in the nursery, surrounded by toys and teething rings and stuffed animals. Thanks for this, it is oddly satisfying for some reason to know we’re not the only ones.